Robyn Rozario jokes that she and her mother have a “crazy relationship” — until they’re in the kitchen. “We always seem to get along when we’re cooking,” said Rozario, a family services coordinator with Catholic Community Services (CCS), a division of archdiocesan Catholic Social Services (CSS). Realizing that fixing a meal together led to “talking about everything and bonding,” Rozario designed an event to help CCS’s clients improve their parenting skills by whipping up lunch. 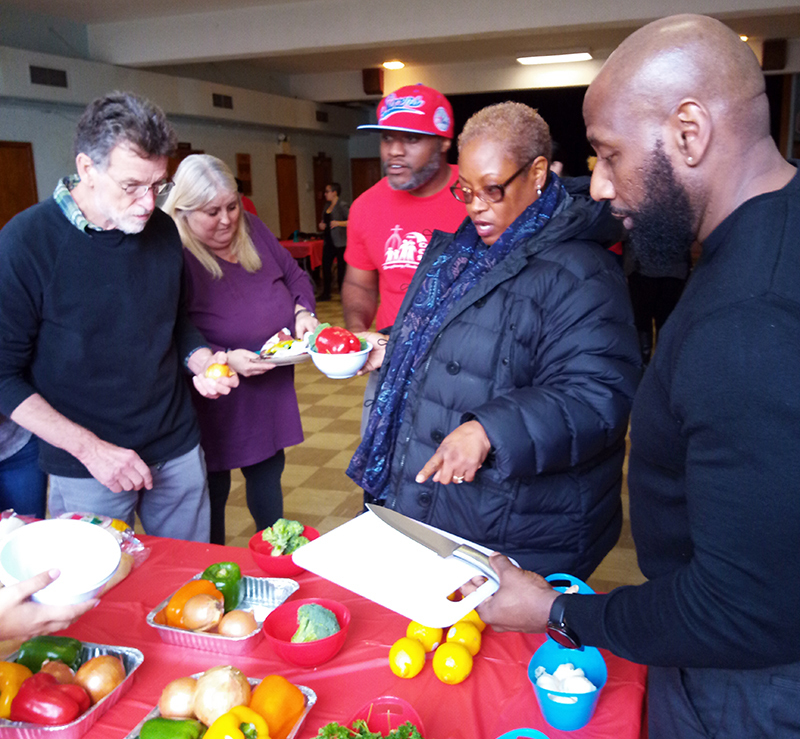 “Chopped: Protective Factors Edition” gathered some 25 adults Feb. 6 at a Northeast Philadelphia kitchen where they worked in teams to transform bags of ingredients into nourishing entrees. CCS provided poultry, vegetables, seasonings and utensils to participants, who wore food service gloves while slicing, dicing and frying at four electric skillet stations. Now in its second year, the event mirrors the Food Network’s show of the same name, right down to the mystery ingredient. Despite the prizes awarded by CCS staff, however, the focus is more collaborative than competitive. That difference is central to CCS’s approach, which stresses five protective factors that can prevent child abuse: social and emotional competence; knowledge of parenting and child development; social connections; concrete support and resilience. The factors are part of the Strengthening Families program, an internationally recognized social services model originally developed in the 1980s by psychologist Karol L. Kumpfer and now implemented widely throughout the United States. CSS utilizes the program at a number of its agencies, including its CCS and Out of School Time (OST) sites. Smith added that the CCS team reviews the protective factors in detail after the meals have been prepared. The cooking exercise engages participants more fully and makes the lesson more concrete, said Rozario. “We review these concepts all the time, but this makes it fun and hands on, instead of just sitting around a table and having a conversation,” she said. Kathy Arbour, who has attended CCS’s parent discussion groups for three years, found her first Chopped event insightful. “It gives you an opportunity to understand that other people are walking the same road, and facing some of the same issues and challenges when it comes to parenting,” she said.